ide, etc. Cloudy swelling of heart, liver, kidneys,etc. Heart: Is of usual size, weighs 330 gm. It is covered with a thick, boggy, shaggy, yellow,fibrinous exudate. 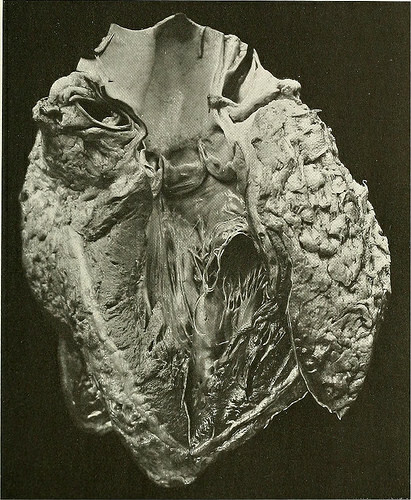 The pericardial cavity contains 600 c.o. of yellow fluid, turbid with fibrin-ous shreds and flecks. The right auricle is of normal size, its tips free from thrombi. Tri-cuspid normal; also the pulmonary. The anterior leaflet of the mitral valve has quite a thickfibrous edge, but the chordos are not much thickened or shortened. Papillary muscles are pale andthickened. Ventricular wall IS to SO mm. and very cloudy. There are a few yellow plaques onthe arterial wall about the aortic valves. Microscopic Examination: The exudate covering the pericardium contains a moderatenumber of polynuclear cells. The muscle-cells are much swollen and have a waxy appearance(parenchymatous degeneration). Bacteriologic Examination: From both lungs and from the pericardial exudate smallcocci were obtained, occurring in pairs, and Gram-positive.